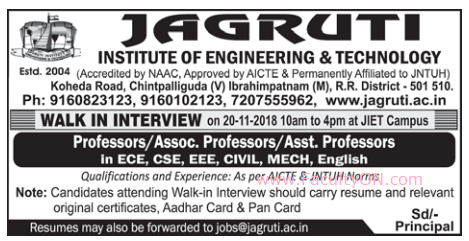 Jagruti Institute of Engineering and Technology, Ranga Reddy has advertised for recruitment of Teaching Faculty- Professor / Associate Professor / Assistant Professor jobs vacancies. Interested and eligible job aspirants are requested to walk-in on 20th November 2018. Check out further more details below. About College: Jagruti Institute of Engineering and Technology (JIET) strives to be one of the most outstanding colleges in the state. As an institute of engineering and technology, it seeks to achieve the highest levels of distinction in the education of students.